I have been testing some services for our project and found this amazing service, thought why not share it with you guys, it might be useful for you. Project management is a term that in some respects appears common, yet in practice still seems to be limited to large companies. While this may be true, the foundations of project management are actually rather simple and can be adopted by anyone, in any industry. One of the major requirements you need to consider when selecting a good project management software is the ability to run and operate it on the go via your mobile devices. Other factors include the ability to access the software from any platform whether it be Linux, Mac, or Windows. This can be achieved when the project management software is web-based. Wrike is a software that does of all this. Wrike is part of the new breed of cutting edge project management tools that allows managers to prepare breakdown their projects and delegate tasks or jobs to specific staff members. It has three components: a browser-based application in the cloud, a Chrome browser extension, and mobile apps in both iOS and Android. Wrike is used by such reputable institutions as PayPal, Adobe, and HTC, among many others around the world. Wrike is considered one of the best project management tools. The cloud-based app allows users to do online project planning where they can organize and monitor progress on all their projects and jobs in real time. When modifications have to be made, moving around a task's due date is easy: simply drag and drop the task on the interactive Gantt chart and all linked tasks instantly change. This online service permits users to deal with even the most complex projects in an organized workspace. It has a great deal of helpful, collaborative functions that assist numerous business around the globe improve performance and efficiency. Wrike provides real-time updates on the status of any task or project, so supervisors can rapidly and quickly scan to track the status of all their work and whether the team is being productive. It permits users to attach related files directly to projects via integrations with cloud storage providers (e.g. Google Drive, OneDrive, Box, DropBox), rather than sending out e-mail attachments. Users can also develop customized statuses and workflows to fit the way the team works as well as monitor resources and plans, analyze performance charts and reports, and evaluate the team's present workload to keep everybody efficient. Wrike helps teams use their resources optimally and lead their groups to success. With Wrike project management software application, your team can achieve important goals faster than ever by enhancing communication, collaboration, and organization. Additional functions include email integration, a real-time Activity Stream of all work updates and discussions, collective document management with version control, Gantt chart maker, timeline generator, integration with lots of other popular web tools, and much more. Due to the fact that it's a cloud-based app, Wrike works cross-platform on any OS. All you need is an Internet-connected browser or mobile phone to access your workspace or to communicate with your team. 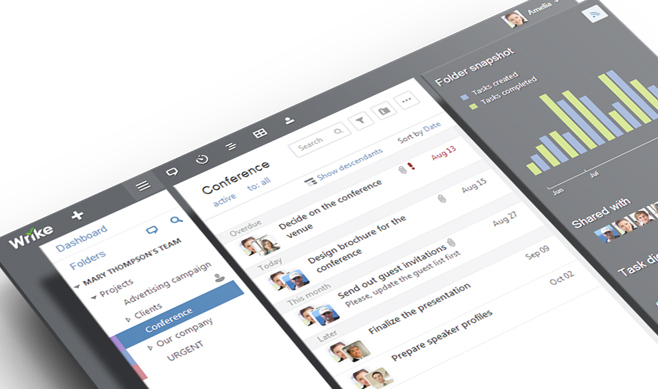 Wrike is a useful project management application for all kinds of organizations and teams. What makes Wrike so terrific? ● Easy to register: The whole sign-up procedure takes less than a minute. Just enter your company email on the homepage and you will receive an activation link within seconds. You just click the link, choose a password and you are done! No need for a credit card for a basic membership. Welcoming group members is an outright breeze as well. ● Modern Collaboration: Imagine this scenario: your sales team is based in Frankfurt, Germany, your software development team is in California, USA, your data entry team is in Barcelona, Spain, and your video editors are in Budapest, Hungary. Wrike permits you to inspect exactly what each and every member of your group is dealing with in real time. You can set their due dates and have access to the latest versions of all attachments. You can even modify the priorities of projects for specific staff members. You can stop using emails to manage work and instead use it for talking about where you want to have lunch. ● User-friendly interface: Wrike permits you to literally dive in right after you sign up. The system defaults to tutorial mode when you sign in for the first time to offer you an overview of the platform. There is even a detailed list of video tutorials readily available on the site and on their YouTube channel, should you ever need a push in the ideal direction. Friendly and patient support team members are likewise available over the phone or via live chat. ✓ Fast and effective mobile app: Wrike enables you to remain on top of things while you are on the go. Whereas another task management tool might have only primary or complementary functions on the mobile app, in Wrike, there is absolutely no function that you use on the website that cannot be used on by its Android or iOS apps. Most of the other apps that are this heavy in terms of functionality tend to crash a lot causing a loss of data and other major inconveniences. ✓ Wrike Chrome/Chromium Extension: Wrike truly understands how online companies work. Many of us do not transform the wheel when it concerns our projects. We are always trying to find motivation, in one way or the other, from around the web. Did you like a nifty trick on a site that you want your designer to replicate on yours? Or did you check out an impressive profile on LinkedIn and want your HR team to recruit the individual? The only thing needed is to click on the Wrike extension and create a task from that webpage then assign it to a staff member. A link to that page will immediately be included in the communication. Furthermore, this widget is actually light and does not hinder the performance of your Chrome/Chromium web browser. It can substantially simplify your everyday decision-making processes. 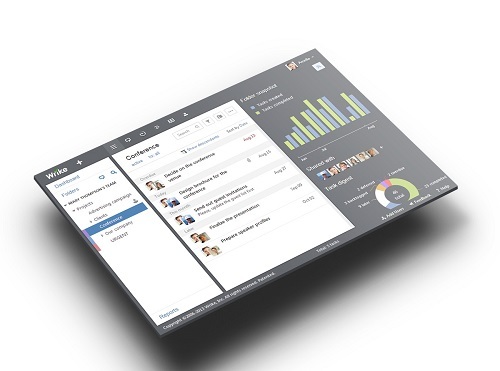 Wrike can be considered the best project management software in the market. It is going to significantly enhance the efficiency of your workers and contractors so that you never fall behind schedule or miss deadlines. It may be time to implement this in your company!